The catalogue of environmental degradation and other changes in the Aral Sea and its drainage basin has spawned numerous research programmes designed to document the physical changes and identify their causes with a view to devising workable rehabilitation schemes. 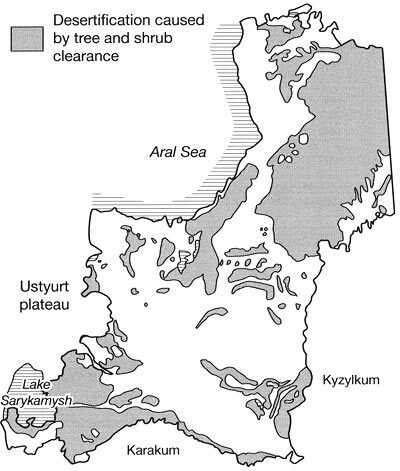 One such programme, focused on the southern and eastern Aral Sea region (Figure 22.6) and conducted over the period 1991-95, examined degradation of soils, vegetation, and landforms to assess the overall state of desertification in the area (UNEPCOM, 1994; Middleton and Thomas, 1997). The study area of 126 580 km2 was divided into nearly 2000 mapping polygons based on the interpretation of remote sensing images ground-truthed by field studies in key plots. The resulting base map, compiled at a scale of 1:2.5 m, was digitized so that thematic maps could be incorporated into a geographical information system (CIS). 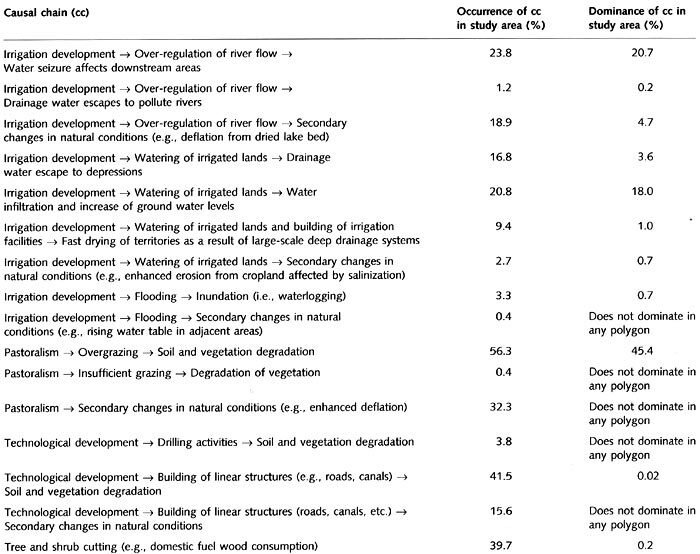 Examination of the human-induced causes of desertification in the study area confirmed the development of irrigation systems to be a major initiator of degradation, but three other human activities were also prominent: poorly managed pastoralism, technological developments such as road-building and drilling for water and oil, and the overexploitation of vegetation for domestic use. Using each of these four activities as a starting point, sixteen main chains of causes and consequences of desertification were identified. These causal chains are outlined in Table 22.7 with an indication of their relative importance given by the proportion of the study area where they occur and are dominant. 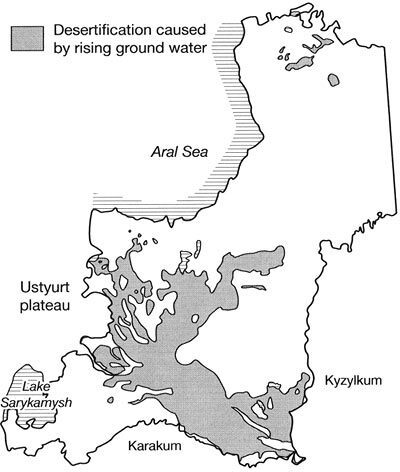 Areas of rising ground water levels which threaten the structural stability of buildings in Nukus, for example, are shown in Figure 22.7. Overintensive grazing is reported to be widespread, leading to degradation of vegetation communities, compaction of soils, and accelerated erosion. Localized degradation due to drilling has led to the destruction of vegetation and salinization of soils. The destruction of trees and woody shrubs (Figure 22.8) occurs principally for fuel wood, but clearance for agricultural expansion and destruction by human-induced fires play secondary roles. The loss of woody vegetation cover has resulted in the disappearance of associated grass species and increased soil erosion. 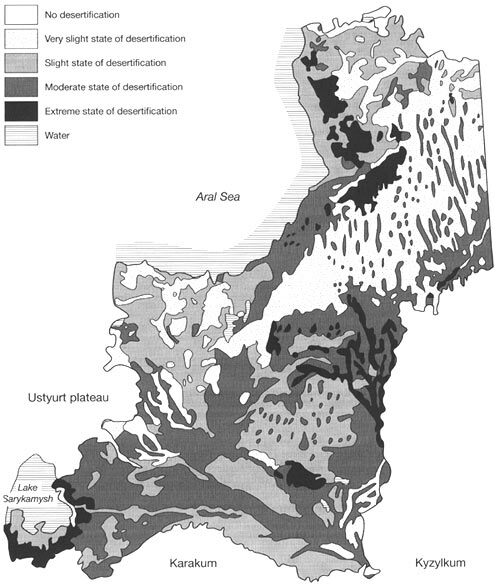 The overall state of desertification in the UNEPCOM study area, an overview of degradation of soils, geomorphology, and vegetation, is shown in Figure 22.9. 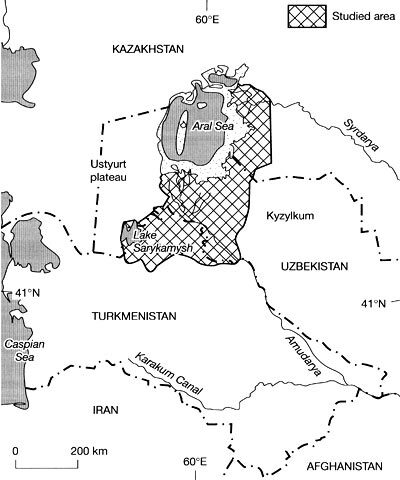 As the map indicates, there are no parts of the Aral Sea study area at this scale of analysis where desertification has reached a very extreme state. Small parts of the area (8.2 per cent in total) are in an extreme state, but more than one-third of the territory (36.7 per cent) is in a moderate state of desertification. About half of the whole area is in a slight or very slight state of desertification (26.4 per cent and 23.7 per cent, respectively), while 1.5 per cent of the study area is not currently suffering desertification of soils, geomorphology, or vegetation.